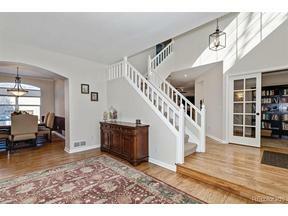 Wonderful home in Chatfield Estates/ Columbine Knolls South neighborhood. Five bedrooms / 4 baths, three car garage. Beautiful open floor concept with formal living room and dining room. Family room with fireplace. Main floor fifth bedroom currently being used as an office. Hardwood floors throughout first floor. New Stainmaster carpet upstairs. Fresh, neutral color paint. Crown molding. New light fixtures, furnace and AC coil. Custom Levolor blinds. Finished basement with recreation room, bathroom and storage. Concrete tile roof. Covered patio with stamped concrete. Large yard. Easy access to shopping and C-470. Minutes from the light rail.